(Nanowerk News) Nagoya University researchers take a nonintuitive approach to metal catalysis for selective conversion of biomass into high-value chemical products under mild conditions (Scientific Reports, "Catalytic transformation of functionalized carboxylic acids using multifunctional rhenium complexes"). The uncertain future of oil feedstocks and environmental pressure are forcing the chemical industry to adapt and find new renewable sources to sustain its activities. Biomass from sources including wood, agricultural waste, and even human garbage, represents a widely available renewable feedstock that has yet to be fully tapped. The problem is that most biomass is a mess of different chemicals, which are difficult to separate and use in high-value products such as plastics and pharmaceuticals. 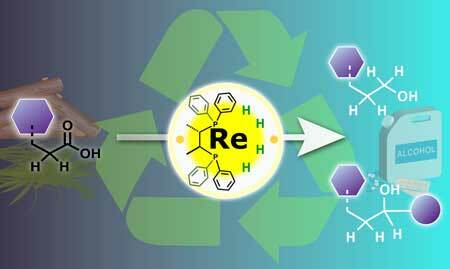 A rhenium catalyst in a high oxidation state is used to hydrogenate carboxylic acids present in organic waste, producing a range of useful alcohol products. Carboxylic acids are one of the most common chemical groups in biomass, and their chemical reactions are particularly difficult to control in these mixtures. Currently used “catalytic hydrogenation” with metal catalysts can transform the acids into more useful alcohol groups, but also adds to the complexity of the biomass because of other side reactions and catalyst decomposition. Recognizing the need for more selective transformations of carboxylic acid groups, a team at Nagoya University explored a different chemical approach to the catalysis of biomass. “Traditionally, low-valent transition metal complexes are used for hydrogenation of carboxylic acids. But we found better selectivity under milder conditions using a high-valent complex, which also attacked carbon-hydrogen bonds next to the carboxylic acid,” says lead author Masayuki Naruto. Hydrogenation is essentially a reduction, during which the metal catalyzes transfer of electrons to the carboxylic acid. Low-valence metals are electron rich, which makes them the obvious choice for hydrogenation of carboxylic acids. However, the team showed that high valence metals could also react with the carboxylic acids by a different pathway, which offered much better control over the reactivity.